Charley Pride is an American country music singer, musician/guitarist, recording artist, performer, business owner, and former baseball player. His greatest musical success came in the early to mid-1970s, when he became the best-selling performer for RCA Records since Elvis Presley. During the peak years of his recording career (1966–87), he garnered 52 top-10 hits on the Billboard Hot Country Songs chart, 40 of which made it to Number One. He was inducted into the Country Music Hall of Fame in 2000. 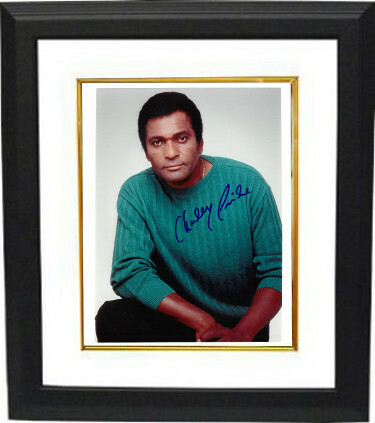 Charley Pride has hand signed this 8x10 Photo. Certificate of Authenticity from Athlon Sports Collectibles. Custom White Mat and Premium Black Frame as shown. Guaranteed to Pass 3rd Party Authentication- Beckett (BAS), JSA or PSA.